Are the Boston Bruins Stanley Cup Favorites? Are the Bruins Stanley Cup Favorites? Predicting the Stanley Cup winner in January is about as fruitless as picking the winner at the start of the season. While trends, statistics and team compositions can indicate and project whether certain players or teams are on the upswing or not, there’s a reason the athletes on the ice play the games. If projections were all that mattered, the Stanley Cup would be awarded every single season prior to the first puck drop of the year. Fortunately, that’s not how things work. Despite this, it would be ignorant to not acknowledge that certain teams have a better chance at winning the Stanley Cup this season (the Tampa Bay Lightning, for example), and some have a better chance of finishing in last place in the NHL (the Arizona Coyotes, for example). Still, teams like the Colorado Avalanche prove that sometimes weird things can happen in professional sports. For whatever reason though, fans and media latch onto the concept of picking winners before they actually come out. Whether it be for awards, championships, draft rankings or anything in between, everybody has an opinion at any given time. It’s easy to get caught up in bettings odds and projections, but it’s also a good talking point when looking at the landscape of the NHL as a whole. Everyone seems to have their own way of measuring success and predicting the future. Well, if predictive stats have anything to say about the 2017-18 Boston Bruins, fans in New England could be pretty happy by season’s end. At least according to Money Puck. Money Puck is a website that uses a very specific algorithm that takes into account a variety of factors and variables in an attempt to figure out NHL teams’ chances of making the playoffs, winning rounds, winning their division and so on. One interesting statistic on their website shows that the Boston Bruins, currently sitting in seventh place in the NHL with games-in-hand during their bye week, have the second-best odds of making the playoffs behind only the Tampa Bay Lightning. The website projects the Bruins to finish in second place in the league with a hair under 111 points as well, as of the time of this writing. The most intriguing statistic on their website, however, may be the fact that the Bruins have the best odds of any team in the NHL to not only make the Stanley Cup Final but to win it as well. Their 13.9 percent odds of winning are 3.4 percent higher than the next closest team in the Lightning and 4.7 percent higher than the Winnipeg Jets. No other team has a percentage higher than 6 percent (the Calgary Flames). It’s still very early in the season as the league just hit its mid-way mark. And even if the playoffs were to start today, the games played on the ice aren’t biased towards the numbers. Hockey is a game of inches and puck luck is a legitimate thing. Any team can win on any given night, and it’s for that reason why any statistic like this needs to be taken with a grain of salt. This information, however, can be used as a tool to indicate just how well the Bruins have been playing as of late though. The hottest team in the NHL despite falling to the Pittsburgh Penguins in overtime in their last game ahead of their bye-week, the Bruins are looking like legitimate Stanley Cup contenders. If the eye test wasn’t showing it, the statistics seem to indicate so as well, at least according to Money Puck’s calculations. At this point in the year, it’s hard to say with absolute certainty that the Bruins have a better chance to win the Cup than the Lightning, the Vegas Golden Knights, the Winnipeg Jets or whoever else may be in contention right now. Similarly, it’s impossible to say whether or not those teams have a better chance than the Bruins. 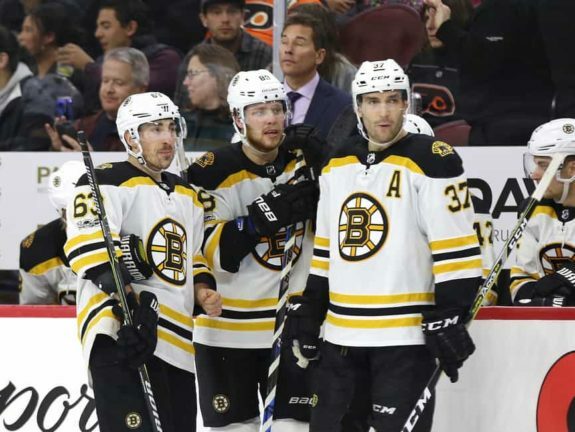 What is clear is that the Bruins are in the upper echelon of teams in the league right now and that’s something very few people could have predicted given the number of uncertainties for the team heading into the year. For starters, the team was primed to start the year with a plethora of rookies playing crucial roles on the club. Fast forward to January and the team is still playing rookies in the lineup, some of whom are taking the opportunity and running with it like Danton Heinen. What’s even more impressive is the fact that there are so many players in Providence that can be called up at any time to give the team a boost, such as Anders Bjork who had an excellent inaugural weekend in the AHL before being given a few days off to rest following his assignment to the team. Another factor came in the form of injuries. No team dealt with as many crucial injuries as the Boston Bruins did early in the season. Some teams came close, in all fairness, like the Anaheim Ducks, but the Bruins were dealing with injury after injury to major pieces on their team. Still, the team stayed afloat in the dismal Atlantic Division and has now hit its stride as the mid-point of the season kicked off. It’s an exciting team to watch in Boston right now, and if predictive stats mean anything, this team could be doing much more than just winning games by the time the playoffs roll around. 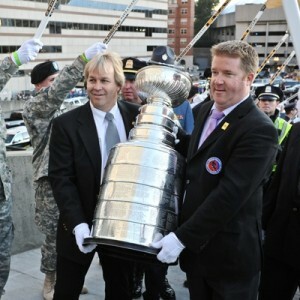 At that point, the hope will be they can win the Stanley Cup.